3PRIMEBASE key features include colour touchscreen user interface for fast program setup. Small space-saving footprint. Block options; 24 x 0.2ml (compatible with 8 tube strips) and 18 x 0.5ml. Fast ramp rate up to 3.0°C/sec. Data transfer via USB. The Prime range of thermal cyclers provide an unrivalled user experience because each unit, from the personal 3Prime right up to the full size PrimeG instrument feature a full colour touchscreen and intuitive user interface. 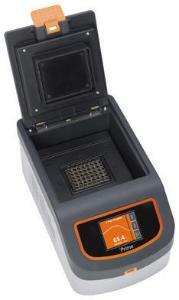 The Prime range of thermal cyclers are also designed to provide easy programming. Pre-installed templates allow the user to quickly create even the most complicated programmes via the intuitive touch interface. All Prime thermal cyclers have the ability to transfer programmes between instruments via USB or to your PC. The internal memory can hold 1000 programmes with unlimited storage available on USB data stick. The Techne Prime range of thermal cyclers are among the most reliable thermal cyclers on the market, backed by a 4 year warranty, the best in the industry. Ordering information: Four-year manufacturer's warranty.